Me starting a problem on Badger Rock. Autumn colours on the fell on Goat Crag in the Lake District. Me climbing back along the traverse that leads to the bell on the Klettersteig Pfeilspitzwand. Me climbing a ladder of stemples on the Klettersteig Knorren. Valerie and me on the summit of the Knorren. Me climbing Crack 1 on Tryfan Bach. Me climbing JT (V0- 4b) at Robin Hood’s Stride. Me climbing Pink Arete (V0- 4b) at Cratcliffe. Climbing in the rain at Stanage. The summit of Mam Tor. Climbing at Buthiers Piscine, Fontainebleau. Me climbing problem number 6 on the orange circuit at Buthiers Piscine. Me climbing problem yellow 28 at Buthiers Piscine. Me climbing boulder problem 26 on the yellow circuit at Rocher des Potets. This is how I found my knee when I unwrapped the bandages 48 hours after the operation. The Tec Step Bionic Turn 2 is Mammut’s top-end via ferrata set. It’s robust, handles well and has some brilliant features, but a swivel joint that doesn’t swivel enough and a couple of simple design issues mean that it isn’t perfect. Me climbing the Klettersteig Pfeilspitzwand using the Mammut Tec Step Bionic Turn 2. Two things persuaded me to buy the Tec Step Bionic Turn 2. The first were the strong safety claims made about it by Mammut. The second was the swivel joint designed to eliminate that annoying problem of your lanyards getting twisted during a climb. that it will still safely hold a fall “in the case of a 180 degree misuse” i.e. a fall when only one carabiner is attached to the cable. A little over half way up the Klettersteig Pfeilspitzwand there is a brass bell hanging from the rock. If you want to ring the bell, then you need to take a detour that traverses the face of the buttress above a sheer drop. There’s a slightly tricky step to negotiate, before you stand on a very small ledge, hang off the cable with one hand and clatter the clanger in the bell with the other. It’s a bit surreal and a bit silly, but fun. Ringing that bell feels like you’re declaring to anyone who can hear that you’ve managed to climb this far. The Kathedrale overhang at the start of the Klettersteig Pfeilspitzwand. Valerie climbing the Kathedrale section on the Klettersteig Pfeilspitzwand. Valerie climbing the Klettersteig Pfeilspitzwand. Me on the Klettersteig Pfeilspitzwand. The view of the Zillertal from the Klettersteig Pfeilspitzwand. Having a brief rest under an overhang on the Klettersteig Pfeilspitzwand. 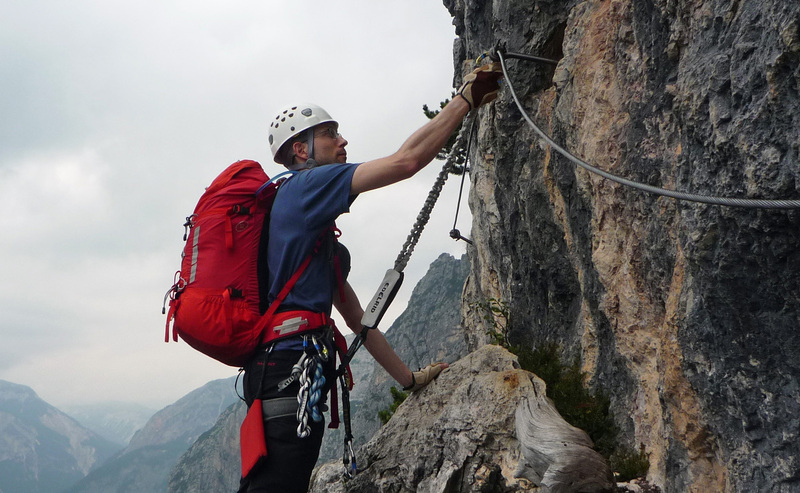 Me standing by the bell on the Klettersteig Pfeilspitzwand (the bell is just visible behind my lanyards). 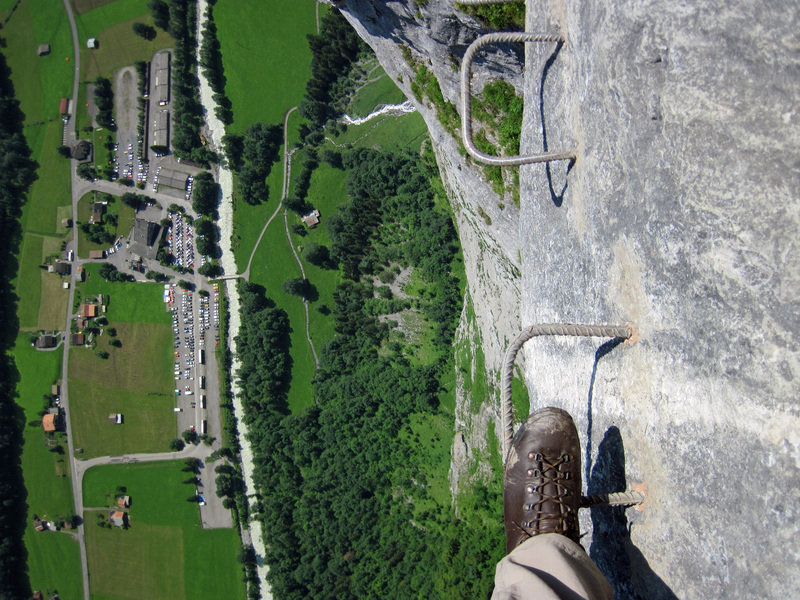 The view down as I traversed across the Lauterbrunnen cliffs. The Red Bull website has an article by Alison Mann with a list of some of the top via ferrata around the world. It was flattering to be interviewed by Alison for the article. 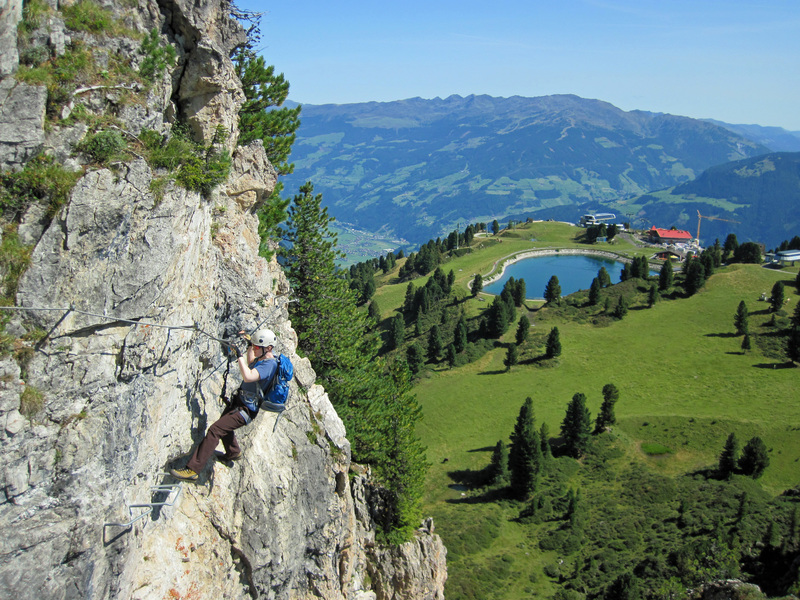 Since Alison and I talked, I’ve been curious to see which via ferrata people suggested as some of the best and the article highlights some amazing routes. 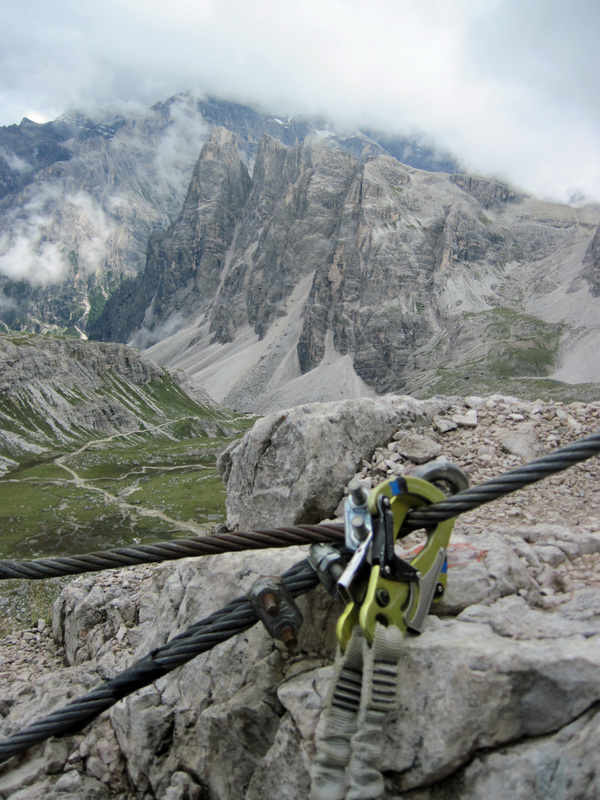 Reading about these via ferrata and seeing stunning photos of them really makes we want to get out there to climb. 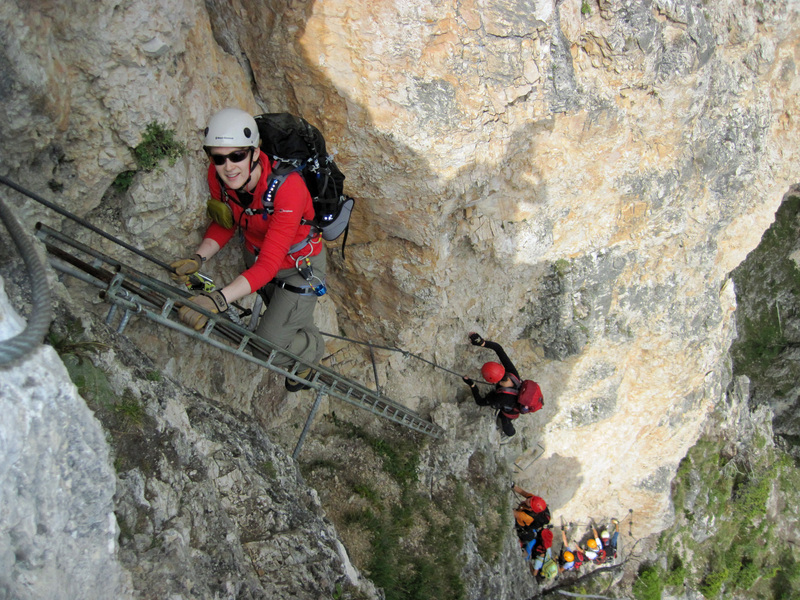 A ladder on the Rotstock Via Ferrata. 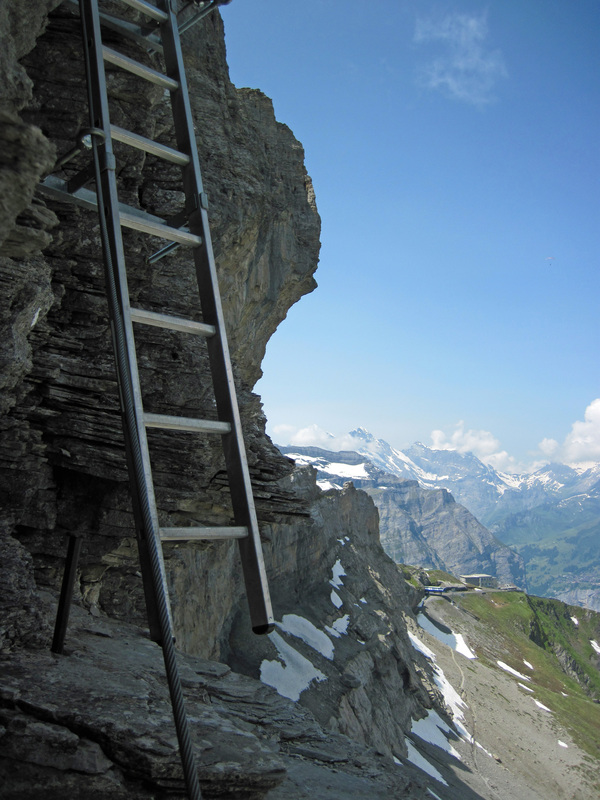 The Eigergletscher Station and Eiger Trail are behind and below. 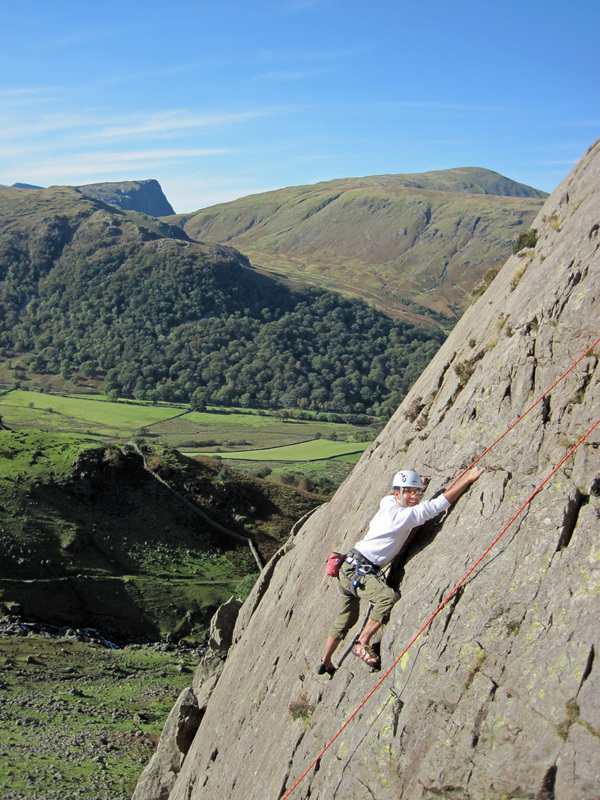 The UK’s first via ferrata is one of the Lake District’s biggest attractions but has also been one of its biggest sources of controversy in the last few years. How might these controversies, and the quality of the climb, affect your decision to pay to climb this via ferrata? 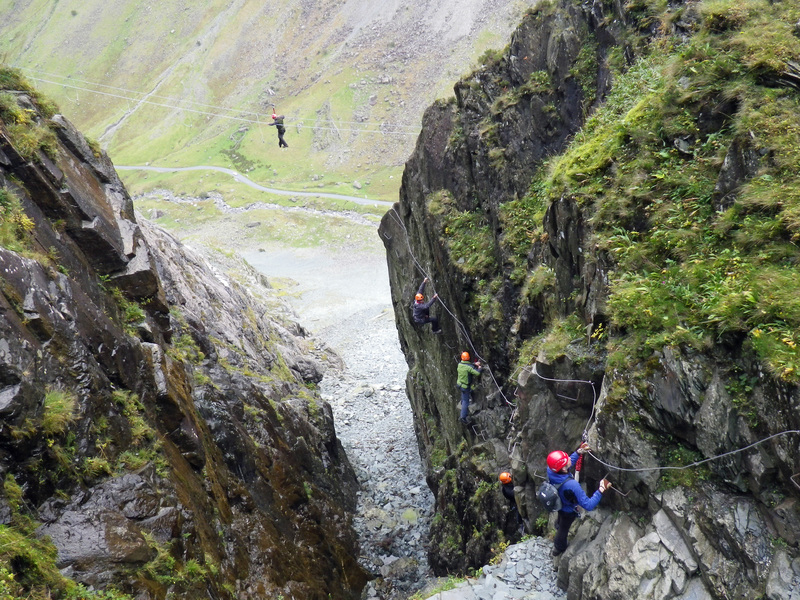 The gully and the Burma bridge on the Honister Slate Mine Via Ferrata. Rock climbing certainly had to be part of it. My best man, Jim, and I agreed that pretty early on. My stag do would have to involve adventure and I’m a keen climber, plus I had met all of my friends who would be on the trip through rock climbing. However, there were some issues with this idea. Climbing on Glaciated Slab in Borrowdale. My brother isn’t a climber and had been less than enthusiastic when I had taken him to a climbing wall in the past. My friends also tend to be wall and sport climbers, with little experience of the trad climbing that is more common in the UK. The solution, I thought, was to find somewhere with some easier, single pitch climbs on which I could set up a top rope. I also thought this would be a great opportunity to try out something I’d been interested in doing for a while – the via ferrata at Honister Slate Mine in the Lake District. I’ve done lots of via ferrata in Italy and I was curious to try out England’s first via ferrata. Climbing on ladders and stemples (i.e. big staples punched into the rock) while attached to a safety cable also seemed more accessible than full rock climbing, while still being a mountain experience and adventurous. 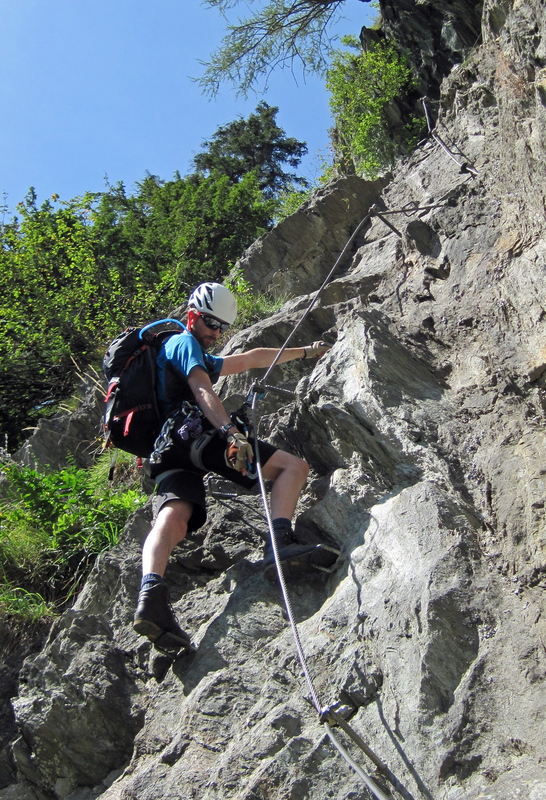 The plan was to do the via ferrata on the Saturday and rock climb on the Sunday. To get round the fact that my friends don’t own tents, we would stay in a yurt. This was something else I’d been interested to try now that there are a few companies providing them as a more glamorous alternative to camping. In a big estate car, we would drive up to Seatoller (in Borrowdale and just below the Honister Pass) on the Friday night and then be ready to go the next morning. 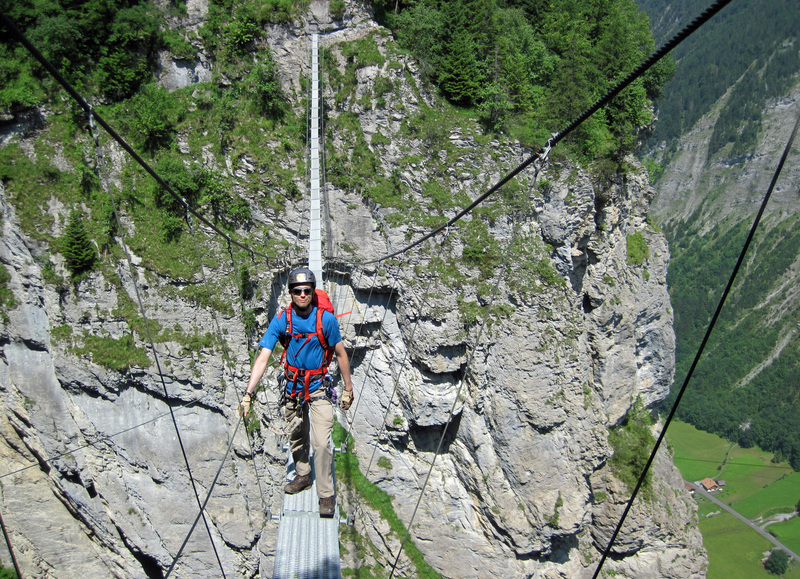 If you have never done a via ferrata before, then there are some things you need to know and consider to have fun and stay safe. Me on the Via Ferrata Lamon. 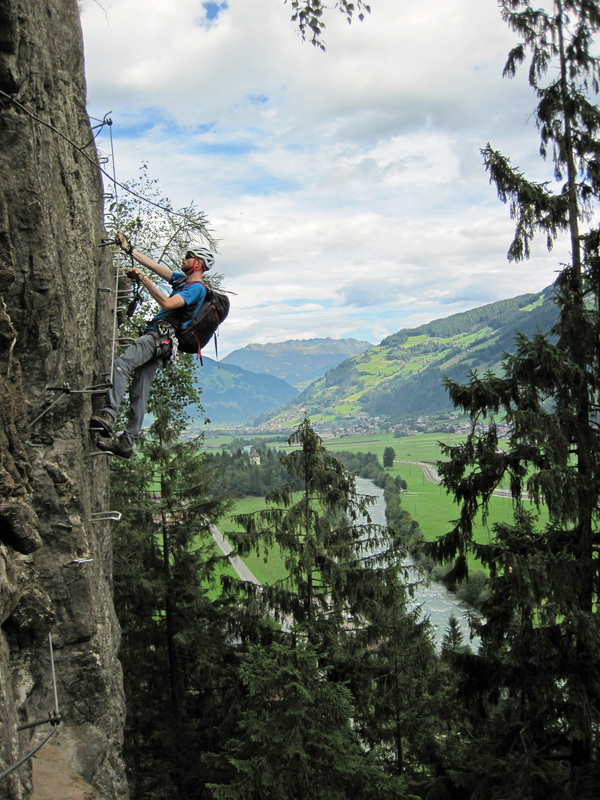 If you are a confident rock climber or a hiker with experience of scrambling, then you should feel comfortable with much of the practice of via ferrata. You are also likely to have the essential skills and knowledge that comes from being in the mountains that you need to keep you safe. 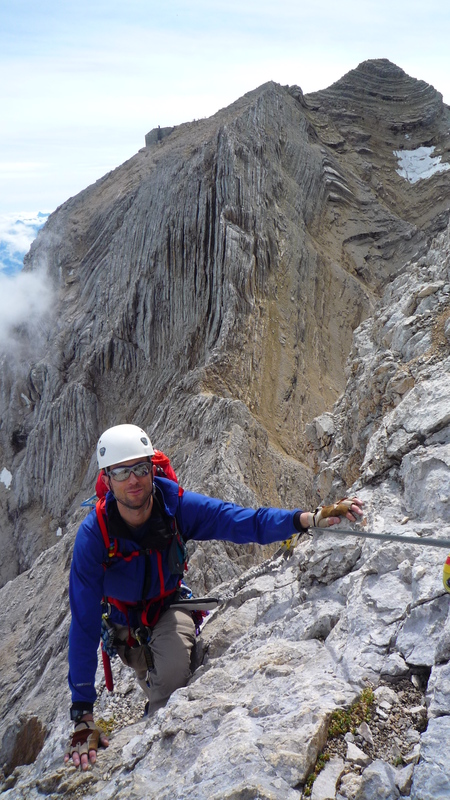 However, even with these skills and knowledge, I would recommend getting yourself familiar with what a via ferrata involves before trying one.